What Are Effective Exchange Rates? Effective exchange rates compare a country’s currency to a basket of other countries’ currencies. The most common way to identify the basket of currencies is to consider a country’s major trade partners. In this case, the effective exchange rate is called the trade-weighted index because the weights attached to other countries’ currencies reflect the relevance of the home country’s trade with these countries. The effective exchange rate measures the value of the domestic currency against the weighted value of a basket of foreign currencies, where the weights reflect the foreign countries’ share in the domestic country’s trade. Therefore, you use the effective exchange rate if you’re interested in the domestic currency’s performance compared to the country’s most important trade partners. The effective exchange rate is usually expressed as an index number out of 100. An increase in the effective exchange rate indicates a strengthening of the home currency with respect to other currencies considered in its calculation. Conversely, a decline in the effective exchange rate means a weakening of the home currency. The figure shows that, during the early 1980s and the late 1990s, the trade-weighted index for the dollar increased, indicating a strengthening of the dollar against its major trade partners. 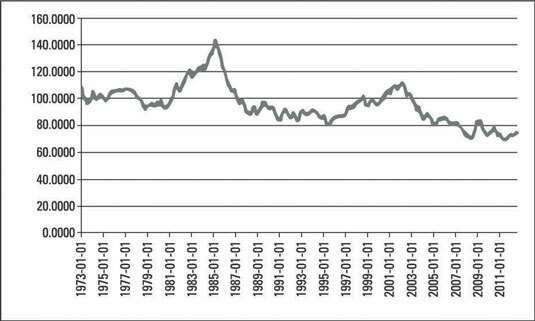 But the overall trend since 1973 shows a weakening of the dollar. Credit: Notes: FRED, St. Louis Federal Reserve Bank. The data are available at http://research.stlouisfed.org/fred2/series/TWEXMMTH?cid=95. The index includes the Euro-zone, Canada, Japan, the United Kingdom, Switzerland, Australia, and Sweden. March 1973 =100.